Chagford is a small town on the north-east edge of Dartmoor and so as you can expect is surrounded by plenty of old farmhouses, some still as part of a working farm, some long since converted to family homes with just a small area around the property remaining and some having made use of the land and reinvented farmland. I visited a property that falls into the latter category, having converted pastoral farmland into stables and a riding school with a family home at the centre. 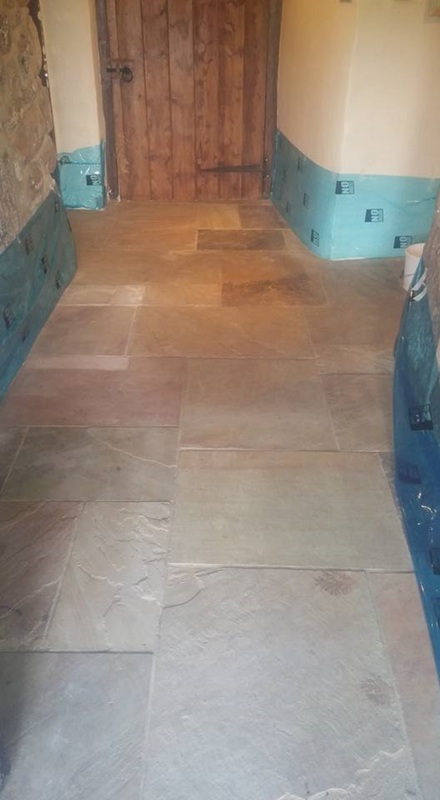 Whilst the owners were on holiday having a well-earned rest a pipe burst flooding the ground floor of their house, damaging the Sandstone flagstone flooring in the process. I went over to inspect the floor and could see that the stone floor had dried out but was now dull from dirt and in addition some of the stones were now suffering from shaling. This is where the top layers of the stone start to delaminate, and the only treatment is to cut the stones back to a decent surface through a process called milling. Tile Doctor has available a set of very coarse diamond encrusted pads for this purpose which I was able to demonstrate. I carried out the demonstration on a small area so that the customers could be confident that there was a remedy and then I measured the floor so that I could work out the amount of products that would be needed and priced the job accordingly. The customers were keen to go ahead with the quote and I arranged to go back and restore the floor at a mutually suitable date. On my return I prepped the skirting boards around the hallway with plastic tape to protect them from the soil generated during the milling process. Once done I started the floor treatment using a very coarse with a 50-grit diamond milling pad to cut the sandstone back and then followed with a 100, 200 and finally a 400-grit pad to get rid of any scratches caused by the coarser pads and to tighten the pores of the sandstone which would allow for easier maintenance. Water is used to lubricate the process and the floor is rinsed with more water, which is then extracted with a wet vacuum between the application of each pad. Once this was completed and the sandstone floor was thoroughly rinsed and then dried with the wet vacuum to remove as much moisture as possible. The floor was then left to dry out thoroughly before I returned to seal. This was a large area and so the milling was done in various stages over a few days so by the time I had finished the last area the first one was nearly ready to be sealed. 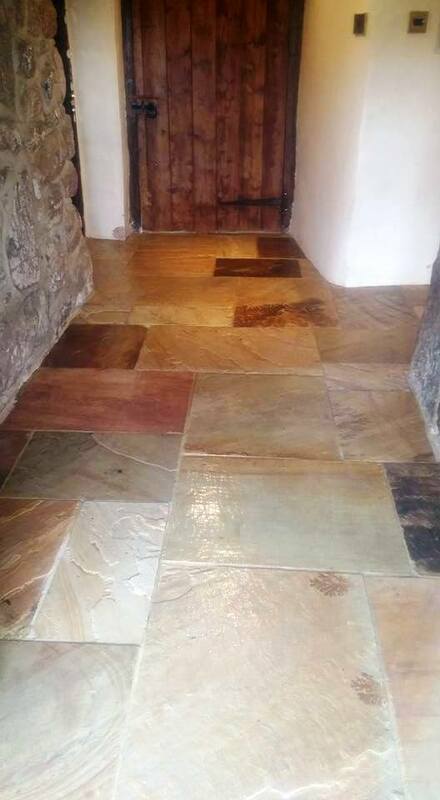 The customers wanted a slight sheen to the stone floor, but not too shiny and so Tile Doctor’s Seal and Go was used; this is an acrylic sealer which once fully cured will settle to a satin finish which works really well on this Sandstone. Like the cleaning the sealing was also staggered into sections to avoid the whole of the ground floor being out of action whilst the sealer dried. Similar to paint drying, the polymers in Seal and Go initially give the floor a semi-gloss appearance and so I warned the customer of this, reassuring them that it would dull to a satin finish over the next week or so. In fact, I called back two weeks later to check and they confirmed this had happened and they were very happy with the result.